I just got a nice little travel book The Chinese Palace at Oranienbaum. by Will Black. Nice photos. Outside looks sad,but inside seems still pretty good. I just got the same book. Below is a scan of a page in that book that shows some of the damage. I'm wondering if the roof has been repaired? It was leaking. I'm also wondering if the drainage system is operational yet. Hmm... I'll have to do some searching. Who occupied this palace in the second part of the 19th century till the revolution? The Oranienbaum was the estate of GDss Ekaterina Mikhailovna (1827-92) and her descendants - Russian Dukes of Mecklenbourg-Strelitz. Did GD Georg and his wife The countess of Carlow, nee Natalia Vanljarskaya lived in Oranienbaum? 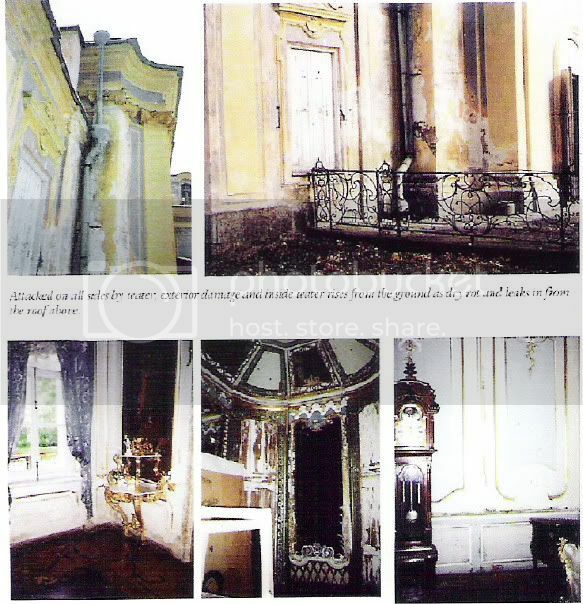 Yes, they were living there from time to time as the Oranienbaum was the life-estate of Duke Georgiy through the will of his mother GDss Ekaterina. So, the descendants of GD Ekaterina, todays Mecklenburg Dukes, they are the rightful owners, right? I don't think so, it's questionable. 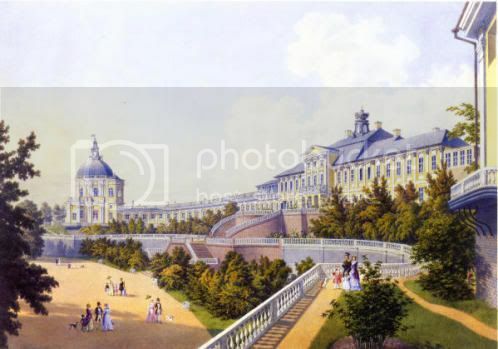 Duke Georgiy had the Oranienbaum as a life-estate that meant his children (becouse of his morganatic marriage) did not have any rights to the Palace and lands around. Duke Mikhail who could devise the estate to his possible descendants did not have children as we know.